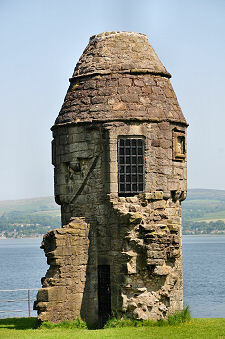 Newark Castle is a fine and well-preserved building sitting on the south shore of the Firth of Clyde and enjoying wonderful views across the river. Its setting is an unexpected one. It lies less than half a mile from the centre of Port Glasgow and immediately to its west is a shipyard. It's all the more surprising to discover that until the 1980s another shipyard occupied the now landscaped areas to the east of Newark Castle and to the south of it: in effect completely blocking it off from inland view. It all looked very different in 1478 when George Maxwell inherited the Barony of Finlaystone and within six years built a castle, his "New Werke of Finlastoun" on this highly desirable site. The name seems to have migrated from "New Werke" to "Newark" quite swiftly. Parts of George Maxwell's castle remain visible in the structure you see today. 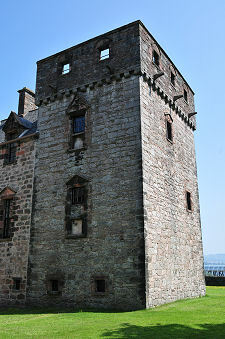 The core of it was the tower house that forms the end of the east wing. The gatehouse that forms the west wing was also a part of the original castle. Within the barmkin wall there would have been a number of other buildings, including a hall that was probably demolished to make way for the later north range. Service buildings like a bakehouse and brew house would also have been built against the inner side of defensive wall, though again these are long gone. 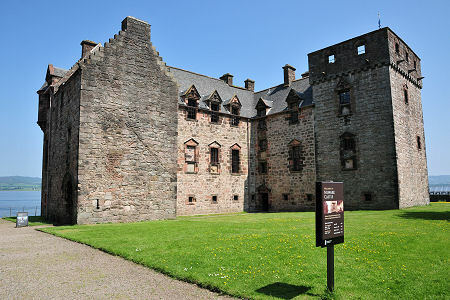 Major changes were made to Newark Castle by the most notorious of George Maxwell's descendants, Sir Patrick Maxwell, who became laird in the 1580s. A friend of James VI and a power in the land in his own right, Sir Patrick murdered two members of a rival family in 1584. He may also have committed another murder, this time of a distant relative, at a later date. Sir Patrick Maxwell was also a wife beater whose long-suffering wife, Lady Margaret Crawford, left him after 44 miserable years of marriage during which time she produced 16 children. This large family brought to a head the need for more accommodation. 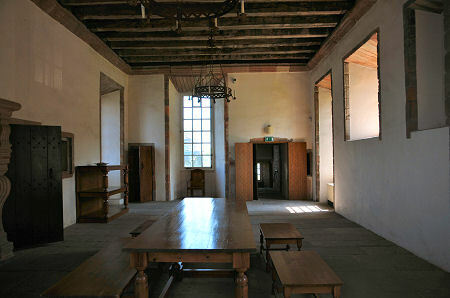 In 1597 Sir Patrick made the changes that resulted in the building you see today. The main addition was the north range. In effect a three storey Renaissance mansion linking together the older tower and gatehouse, this dramatically increased both the quality and quantity of space available to the family. At the same time the barmkin wall was demolished, save for the north east tower, which became a dovecot. And the tower roof was converted from defensive battlements into something more suited to leisure than warfare. By the late 1600s Glasgow authorities had long been wrestling with the problem of creating a deep water channel along the River Clyde as far as Glasgow itself. To overcome this they looked further down river and in 1668 purchased 18 acres of land around Newark Castle from the then laird, Sir George Maxwell. This was developed as a port to help service Glasgow. The new development was initially named "Newport Glasgow", which soon became "Port Glasgow"
In 1694 the last Maxwell died and the castle and remaining land was sold to the first of a series of non-resident owners, the last of whom passed Newark Castle into state care in 1909. 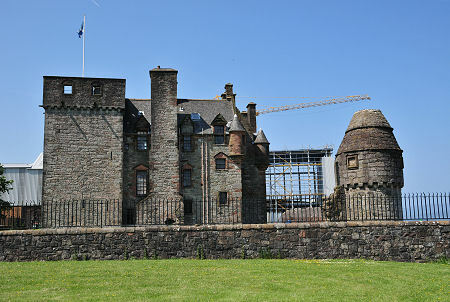 It is now looked after by Historic Environment Scotland. 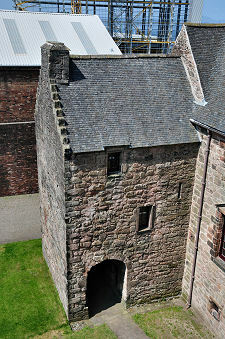 Newark Castle had a number of uses during the interim. One of the early tenants was a ropemaker called John Orr. He also made money dealing in wild animals such as big cats and bears, which he acquired from ships visiting the Clyde. 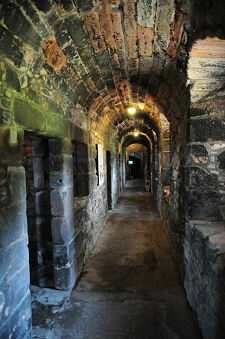 His animals were often housed in the castle cellars. A few years later the cellars in the north range were used to store fruit grown by Charles Williamson, who rented the gardens. 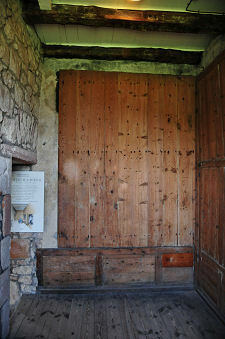 He ended up blocking access to the cellars from the hall above them to prevent John Gardner, the joiner who rented the hall, from stealing stored fruit. Having emerged from its centuries totally hidden by shipyards, today's Newark Castle makes a fascinating visit. There's plenty to explore, and the experience is enhanced by the River Clyde frontage, by the views from the tower, and by the highly unusual history and surroundings.